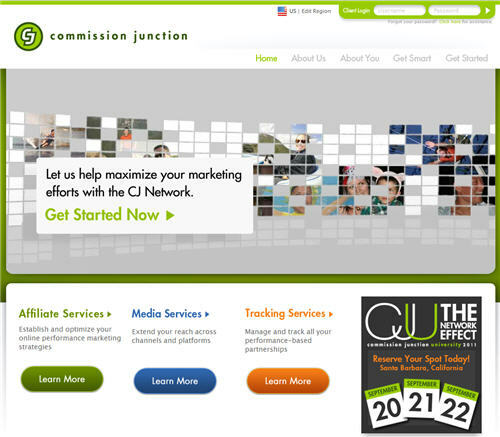 Commission Junction has launched a new version of cj.com. We’ve organized our offer under three distinct service lines: Affiliate, Media and Tracking. This re-organization reflects our position that the CPA pricing model is relevant and increasingly prevalent beyond traditional affiliate marketing channels. Our future — and the success of many of our current and future clients — is in pay-for-performance marketing, which includes and also reaches well beyond affiliate marketing. Our Affiliate Services line is stronger than ever, and the re-launch of our site coincides with numerous and ongoing technology and service upgrades. Our Media Services line enables advertisers to reach beyond traditional affiliate relationships, leveraging the same infrastructure and expertise they use to drive their current affiliate programs. Our Tracking Services line supports marketing partnerships of all kinds with the same technology and experience that CJ has in place to run our affiliate platform. The relaunch of their site also includes a refresh of the CJ logo and overall look and feel. They’ve also got printable PDF’s throughout the site on each of their three service lines. See for yourself at http://www.cj.com/.